May Showers Seal a Wet Spring, but What Will Summer Bring? Last month's rains washed away any lingering drought in North Carolina and topped off the rain gauges in a particularly wet spring. Click any underlined heading in the graphic to read more about that topic, or scroll down to read our full climate summary. Also, check out the summer outlook in the blue box at the end of each section. Last month's statewide average temperature of 67.11°F was about a degree above the 1981 to 2010 average, ranking as the 45th-warmest May out of the past 123 years. While our mean temperatures ranked near normal, the same couldn't be said for our highs and lows. Many sites reported average low temperatures ranking among the top ten warmest on record (below), while average high temperatures were generally within a degree of normal. The main reason for both was the ample cloud cover, which held down daytime temperatures but let less heat escape at night. Minimum temperature rankings for May highlight last month's frequent cloud cover. For the spring as a whole, our mean temperatures were also about a degree above normal thanks to a near-normal March, our warmest April on record, and a slightly above-normal May. The statewide average temperature of 59.45°F ranks as the 26th-warmest spring on record. Temperature-wise, it was similar to last spring, which was 0.09°F warmer, on average. Although cloud cover has inhibited our high temperatures, the eastern half of the state aside from the ocean-cooled Outer Banks has already reached the 90 degree mark this year, with one such occurrence in Raleigh and Elizabeth City and as many as nine 90°F+ days in Lumberton. The western Piedmont is running slightly later than normal -- the average first 90°F day is May 17 in Greensboro and May 21 in Charlotte. However, it's not unusual to wait this long before the heat arrives. Last year, Greensboro's first 90 degree day didn't come until June 13. Current forecasts suggest that this June might not see the same persistent heat that we've had in recent years. 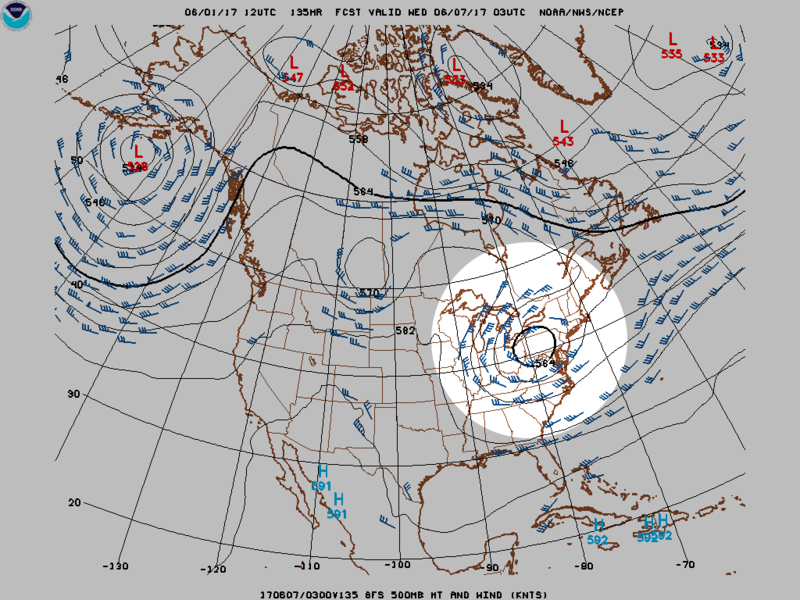 Next week, a trough in the jet stream is expected to dig down across the east coast, which should bring near-normal or slightly below-normal temperatures. That amplified jet pattern is reflected in the Climate Prediction Center's temperature outlook for June, showing below-normal temperatures likely to our west and equal chances for above-, below-, or near-normal temperatures across most of North Carolina. In the longer range, though, expect the summer heat to build as we head into July and August. That abundant cloud cover also brought showers and storms that left us with one of our wettest Mays and spring seasons on record. Last month, the statewide average precipitation of 6.45 inches ranked as the 6th-wettest May since 1895, and for the season as a whole, the average precipitation of 17.44 inches made it our 3rd-wettest spring on record. The heaviest rainfall last month fell across the western half of the state. Boone received 14.39 inches of rain last month to record its wettest May since 1981. Just up the road in Jefferson, 12.83 inches fell last month -- the wettest May there in the past 87 years. For the spring as a whole, Boone was again the statewide rainfall winner with 28.31 inches total. Nearly everywhere in the state received more than 12 inches of precipitation over the past three months, which helped remove the drought and dryness that covered nearly two-thirds of the state as recently as late March. US Drought Monitor maps for North Carolina on March 28 (left) and May 30 (right). Our precip. is now somewhere between 3 to 4 inches over the average. The soil is damp. All native vegetation continues to grow and flower. Lawns are wet. Soil moisture levels are above normal for this time of year. The ground is soft everywhere. The smaller streams are flowing vigorously, larger streams are full and the rivers are above their normal flow. The water is all clear as it makes its way down the mountains. It appears that our wet pattern may continue for much of June. A southward-sinking jet stream would usher in more rain-bringing weather systems, and the Climate Prediction Center calls for increased chances of above-normal precipitation across much of the Southeast US this month. Guidance is weaker for the summer as a whole, with current forecasts showing equal chances of above-, below-, and near-normal precipitation. That's not unusual his time of year due to the pop-up nature of afternoon thunderstorms that bring the bulk of our rainfall. Confirmed tornadoes in North Carolina last month. On May 5, early-morning storms across the northern part of the state spawned EF-1 tornadoes near Eden in Rockingham County and near Oxford in Granville County, as well as EF-0 tornadoes near Rockyhock in Chowan County and near Camden in Camden County. Across the Coastal Plain on May 23, an EF-0 tornado hit near Parkton in Robeson County, an EF-1 formed near Autryville in Sampson County, and an EF-1 affected Gum Neck in Tyrrell County. 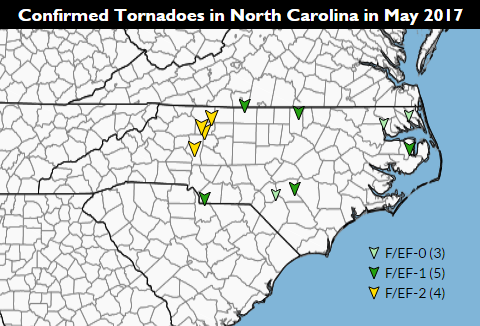 Finally, on May 24, strong storms in the western Piedmont spawned five tornadoes: an EF-1 near Monroe in Union County and EF-2s near Statesville in Iredell County, near Mocksville in Davie County, near Yadkinville in Yadkin County, and near King in Stokes County. These 12 tornadoes are tied for the 20th-most in a single month in North Carolina since 1950, and the most since 18 tornadoes hit in April 2014. The highest number of tornadoes in a single month was 48, which occurred in April 2011 -- memorable because of the April 16 outbreak. That wasn't the only damaging severe weather last month, though. Storms moving through northern Sampson County on May 29 produced straight-line winds with speeds of more than 70 mph according to the National Weather Service in Raleigh. Those strong winds damaged homes, cars, and trees, and are blamed for 12 injuries as well. Climatologically speaking, we've had only about 60% as many tornadoes in June (1.86 per year, on average) as in May (3.21 per year, on average). However, that certainly doesn't mean our risk vanishes as we turn a page of the calendar. Especially if we keep the active weather pattern in June as current forecasts suggest, the chances for seeing severe weather would be higher than normal. To make sure you're ready in case severe weather strikes your area, check out the National Weather Service's safety tips from this spring's Severe Weather Preparedness Week.